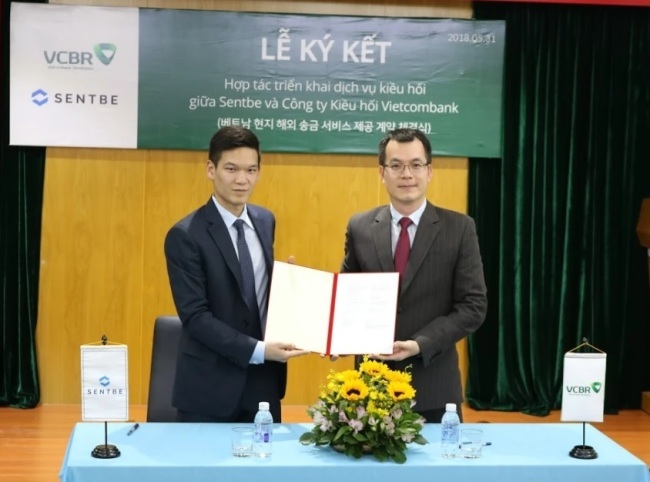 South Korean remittance startup Sentbe said Tuesday it has signed a memorandum of understanding with Vietcombank Remittance. The move will allow recipients to pick up wired money in an hour on average from some 2,500 automated teller machines or some 500 branches that belong to Vietcombank, as well as some 500 nonbank cash pickup centers, with up to 95 percent lower commission fees, the startup said. This is a step up from the Korean startup’s existing partnership with Vietnam. Vitecombank Remittance is a subsidiary of Vietnam’s largest commercial bank by branch network, Vietcombank. Sentbe operates its cross-border wiring service mainly with 12 Asian countries: the Philippines, Vietnam, Indonesia, China, Japan, India, Malaysia, Sri Lanka, Thailand, Bangladesh, Pakistan and Nepal.